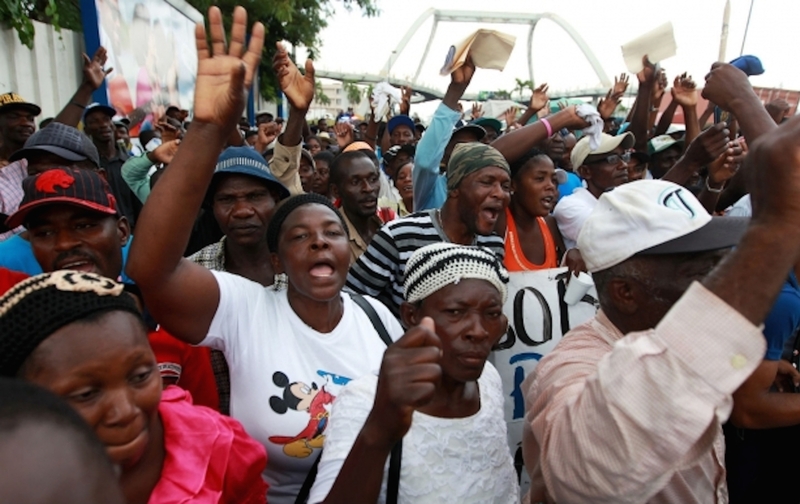 American media upped its coverage of the Dominican Republic’s internment and deportation practices, but the repression of Haitians continues. Padilla is referring to a series of recent actions taken by the Dominican Republic that make life miserable for the hundreds of thousands of Dominicans of Haitian descent: revocation of their citizenship; a June 17 deadline for leaving the country if they couldn’t prove they were born in the DR; and the threat of mass deportation. As the online machine picked up after the original post, I got information out through the Daily Kos, Jet magazine, RYOT and a few others. The mainstream media soon caught on, and I started giving interviews on background to reporters from The New Yorker and The New York Times Magazine. Couldn’t get to everyone, though. As the registration deadline hit on June 17, big outfits started sending teams down over the second half of June, and I ended up taking a number of crews out to neighborhoods where I work and live in Santo Domingo and Puerto Plata. Vice’s crew was pretty good, if a bit sensational. Al-Jazeera’s folks were quite professional. The piece that I’m proudest of, though, was an A1 front page article in The New York Times on Saturday, July 4, that did a more in-depth look at my multi-ethnic neighborhood in Puerto Plata and the complexities of relationships and sentiments at the community level. Their Bureau Chief and a photographer spent an entire week with me. So, where are we now? The mass detentions and deportations that the government had threatened have thankfully not yet come to pass. Although it is of course impossible to measure a counterfactual, I would like to think that our efforts made some small contribution in stirring up the international attention enough to put the authorities on notice that they were being closely watched. Whatever the case, the worst-case scenario has been staved off, at least for now. Does this mean Haitian migrants are in the clear? No. What I have seen since the deadline passed is a sharp uptick in so-called “self-deportations,” in which undocumented Haitian migrant families pack up all of their household belongings into rented pick-up trucks and head back to Haiti, ostensibly of their own volition, rather than risk getting picked up on the streets, detained and summarily transported across the border without getting a chance to get their affairs in order. On the ground and behind the lines, though, a more sinister picture continues to emerge. At the crossings, Haitian border guards tasked with registering returnees have only two options for classification: “Voluntary” (i.e., ‘self-deporting’) or “Involuntary” (i.e. officially arrested, detained, and deported by the security forces and/or migration officials). However, Haitian border guards at the Dajabon, Beladere, and Jimani border crossings all told me that many of the returnees are actually leaving under harassment, intimidation, and threats of violence by the security forces and Dominican street gangs acting as plainclothes proxies. This recently happened in an abandoned hotel named Jardin Deportivo in my neighborhood in Puerto Plata, which had been occupied by Haitian squatters. Several hours before dawn on June 6, three unidentifiable men began pounding on occupants’ doors and demanding that they leave or else their houses would be burned down. Given the long history—and historical memory—of anti-Haitian violence in this country, these threats—notably of house burnings—reported at multiple locations, are credible enough to impel many families to leave, especially when coupled with the now-ubiquitous sight of security force patrols in pick-up trucks roaming the streets at night. In my assessment, self-deportations under these conditions don’t quite equate to a truly “voluntary” return. You don’t have to just take my word for it, though. These observations were echoed a week ago on July 14 by the International Organization for Migration, which has been monitoring all major border crossings for the past month or so. Their initial findings from interviews with over 1,100 individuals from about 350 households are that about 36 percent of returnees said that they had been forced out. The IOM’s piece is here. So instead of a short series of purgative mass deportation events, anecdotal evidence is mounting that the situation may be evolving into something more sophisticated, more behind the scenes and sinister. It involves constantly prowling police and military vehicles and strange men pounding on your door in the dead of night and threatening to pour gasoline under it. Meanwhile, the Dominican Republic has hired a public relations firm, Steptoe & Johnson, to lobby the US Congress and counter negative press. Steptoe & Johnson has been passing out talking points describing DR’s immigration policy as “modern and transparent” and as a means of protecting the “fundamental rights” of everyone living in the Dominican Republic, points echoed by Dominican officials. It’s important to counter the idea that this slow-motion, undercover pogrom reflects timeless, atavistic racism on the part of all Dominicans. It doesn’t. Rachel Nolan has done a follow up interview for Jacobin that discusses US immigration policies (“the US has helped to fund and train the Dominican border police”), a topic Todd Miller has described in detail here. I related the rise in anti-Haitian racism to the CAFTA-DR, a 2007 multilateral corporate trade treaty with the United States that includes Central America: Since the treaty went into effect, the DR has witnessed growing rural and urban immiseration, even as its economy has expanded. A “third of the country’s total population lives in poverty, and almost 20 per cent are living in extreme poverty.” In the cities, the number of poor people has doubled since 2000, from 1.2 million to 2.4 million, according to the World Bank. Unification between the two countries [in 1822] came at the invitation of numerous Dominican towns. It brought the end of slavery. All of the citizens of the island enjoyed and defended their independence for decades and decades, long after the countries formally split, as their nearby neighbors remained colonized (and hundreds of thousands, still enslaved). They did so, precisely, together. These facts were as immediately obvious to elite commentators seeking separation as they were to the great majority of the island’s residents, who manifested profound and dynamic interconnection. Decades after unification ended, Dominican-Haitian collaborators helped to win Dominican independence, for a second time, in 1865. The Dominican constitution changed that same year to jus soli citizenship; a handful of reformers called for dual citizenship across the island. It took concerted ideological work, backed up by bloody, racist repression, by Dominican elites to first bury this history, and then distort it: “Xenophobic, racist, and hostile voices on and off the island” transformed a popular act of transnational solidarity into an “invasion.” Racism in the DR is no more timeless or cultural than it is in the United States: It has a past, but what keeps it up-to-date are present politics and economics.